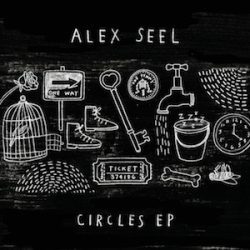 Native of the UK, Alex Seel has been steeped in folk music, and this is audible in the guitar playing on this ”Circles EP”, especially in the title track kicking off the EP. With gorgeously rich picking and with vocals almost secondary, this feels quite authentic and without polish. There is more of a full beat on Broken Faucet, which adopts more percussion and bass to create a richer sound. There is also a bit more bounce and power in the vocals, particularly in the chorus which uses more different rhythms to keep the listener interested. Poor Boy goes even further along these lines, with an almost swing rhythm and full instrumental backing, including with a drum kit. This is an obvious candidate for a single and crowd favourite at a gig, being much smoother and upbeat that we have seen already in the EP. The Island returns to a more stripped back approach, although there is still a gentle drum kit backing. There is also slight reverb in the vocal which creates a cool effect that makes this slightly more rock ‘n roll ballad than classical folk, but this is one of the most enjoyable tracks on the EP. The EP finishes with Curious Heart, book-ending the EP with acoustic tracks. This is another gorgeous track, with a slightly lower register than we have heard as of yet, which brings out the best in Alex’s vocals. The ”Circles EP” is a highly enjoyable listen, and Alex Seel is an artist to keep an ear out for. A very enjoyable EP from a UK native. One to watch.